In Schema Premium Plugin; each schema.org type you enable contains a set of location rules. 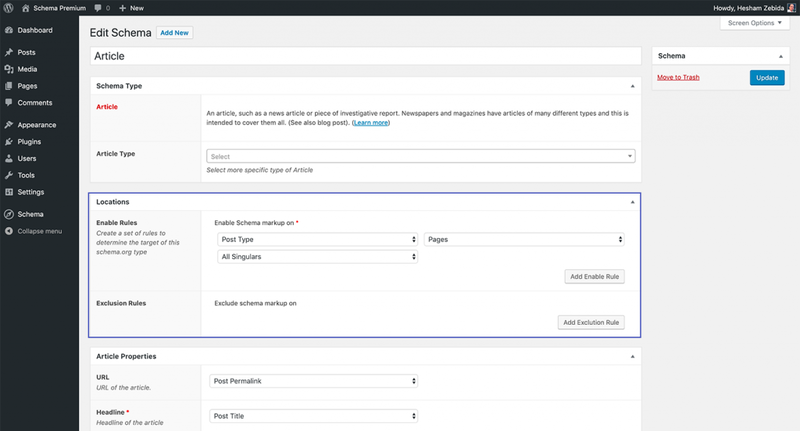 These rules are used to decide where to enable schema.org markup throughout your WordPress site content. Define a value for the rule type. When editing a Schema type, the ‘types’ drop down is the first dropdown in the location rule row. When editing a Schema type, the ‘values’ drop down is the second dropdown in the location rule row. This list is dynamically updated based on the selected ‘type’.